And one was drowned in the great bog of Clone. From somewhere in the neighboring cottages. O towards I have forgotten what—enough! “The Tower” is one of the longest poems written by William Butler Yeats (1865-1939). It was written in 1926 and was the title poem of the collection that he published in 1928. 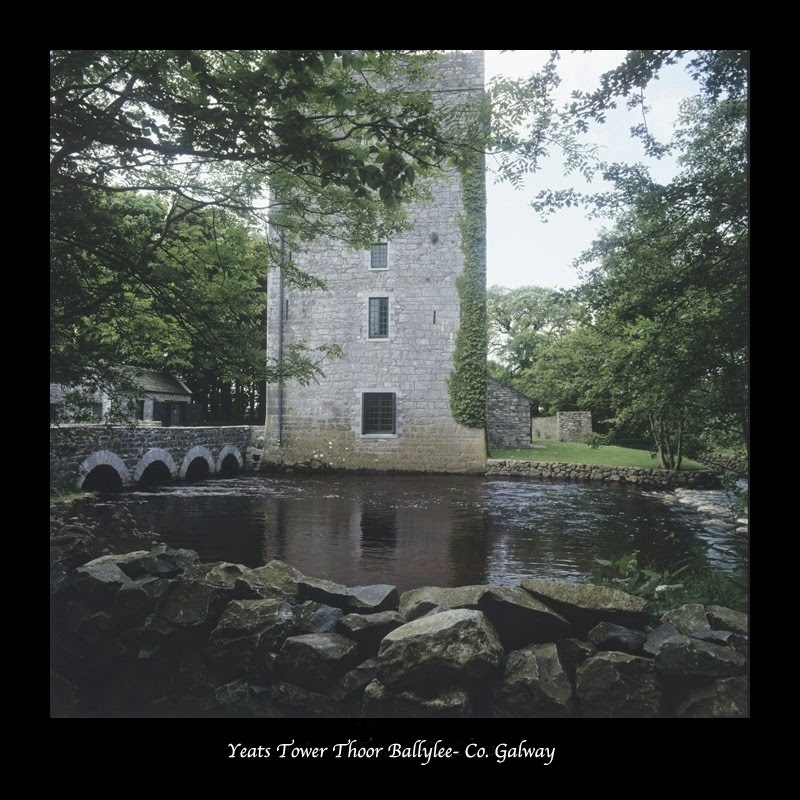 The tower in question is that of Thoor Ballylee in County Galway. It is a typical Irish square castle tower (built around 1500) that Yeats bought in 1916 and restored over several years. It was his summer home until 1929. It was also the first property that he had ever owned outright. Yeats had turned 60 when he wrote “The Tower”. He was aware that he is getting older and that his health was beginning to fail. He was therefore moved to take stock of his life. The tower, with its long history and associations with past legends, symbolized the passing of time and gave rise to thoughts about how people in the past had dealt with the approach of old age. The first section of the poem’s three sections comprises 17 lines. In them, Yeats considers the “absurdity” that is “decrepit age”. He feels that his mind is as active as ever (“Never had I more/Excited, passionate, fantastical/Imagination, nor an ear and eye/That more expected the impossible”), but his body is not as nimble as when he was a boy climbing the local mountain with “the livelong summer day to spend”. The reference to his “troubled heart” can be taken, for once, as a literal rather than a poetic one. The alternative, he feels, is that poetry must be abandoned (“I must bid the Muse go pack”) in favor of the consolations of philosophy (as represented by Plato and Plotinus). Imagination, ear and eye will have to be “content with argument”. The second section is much longer, comprising thirteen eight-line stanzas with an AABBCDDC rhyme scheme (although a number of the rhymes are half-rhymes). As he walks on the battlements at the top of his tower, Yeats chooses to use imagination as a tool to seek out the past and “call/Images and memories/From ruin or from ancient trees”, because he wants to pose a question to some of the people who once lived in the neighborhood and whose spirits still seem to haunt the place. He takes time to tell a few of their stories before asking his question. First there is Mrs French, who sent her serving-man to cut off the ears of a farmer who had been insolent to her. The ears were presented to her in “a little covered dish”. Then there is the story of the men who, after a night of drinking and singing, resolved to “test their fancy” for a local peasant girl by going to find her but they fell into the local bog, where one of them was drowned. This second story had come from a song written by Anthony Raftery (1784-1834) who, as a blind poet, was, to Yeats’s mind, Ireland’s equivalent of Homer, “that was a blind man”. Yeats is thus prompted to compare the peasant girl with Helen of Troy in her ability to drive men mad with desire and lead them to their doom. Although he does not make the link directly in the poem, Yeats is clearly thinking about the unrequited love of his own life, namely that for Maud Gonne, whom he had pursued for many years without success and who he had often compared with Helen of Troy (as in his earlier poem “No Second Troy”). Yeats next recalls a character that he had invented himself in a series of short stories entitled “The Secret Rose” (1897). This is “Red Hanrahan”, a country poet, who was able to perform feats of magic. Yeats repeats one of his stories for two stanzas of “The Tower”, but then breaks off to bring in “A figure that has grown so fabulous …”, namely a former owner of Thoor Ballylee who went bankrupt. This then prompts Yeats to mention all the previous men-at-arms who had garrisoned the tower in past centuries. After a stanza (the tenth of the second section) that summarizes all these characters, Yeats ask the question at which he had hinted earlier, which is whether they did: “… in public or in secret rage/As I do now against old age?” However, he then dismisses all the “real” characters and only asks that Hanrahan stays behind, he being the poet that only existed in Yeats’s own imagination. Yeats has another question for Hanrahan, which is: “Does the imagination dwell the most/Upon a woman won or woman lost?” Clearly Yeats has Maud Gonne in mind as his “woman lost” and, by invoking the spirit of his own invented character, it is his own memories and imagination that he is calling upon to answer the question. His conclusion, at the end of this section of the poem, is that such a memory can only result in: “the sun/Under eclipse and the day blotted out”. The third section has a very different character to the preceding section, in that it comprises four stanzas of different lengths (respectively 45, 7, 8 and 15 lines), the lines being short and half-rhymes being much more common than full ones. The pace therefore picks up as Yeats makes up his mind and declares his intentions unequivocally and boldly. This section is possibly one of the finest passages that Yeats wrote in his later poems. The words tumble out as Yeats makes it crystal clear that he will always place poetry above philosophy. He begins by stating that: “It is time that I wrote my will”, and the first thing he wishes to bequeath is his pride, which he had inherited from people who were bound: “Neither to slaves that were spat on, Nor to the tyrants who spat”. His inheritance is from people who were not afraid to speak their mind in the cause of freedom, and he mentions two Irish politicians from a previous age (Edmund Burke and Henry Grattan) whom he admires for that reason. Yeats declares that his inheritors will be: “…upstanding men/That climb the streams until/The fountain leap …”. In other words, they will be another generation of people just like he was when young, as these lines echo those at the start of the poem about his explorations as a young boy on the mountain of Ben Bulben. Having previously wondered about devoting his last years to the study of Plato and Plotinus, Yeats now declares his faith: “I mock Plotinus’ thought/And cry in Plato’s teeth”. It is through constructing systems of thought that man has: “Made lock, stock and barrel/Out of his bitter soul”. Far better, says Yeats, for “Poet’s imaginings/And memories of love” to be the building blocks for “… a superhuman/Mirror-resembling dream”. He likens all the memories that the poet accumulates through life to the sticks laid by jackdaws as they build their nests outside the tower. Each is insignificant by itself, but together they form the cradle in which new life can be created. As stated earlier, this is a long poem that has many facets to it. There is much to be gleaned from it over several readings and it has many memorable and well-crafted lines. It is a poem that entertains as well as posing questions and suggesting answers. It is not easy to classify Yeats in poetry because he is a modern poet but not modernist, symbolist or imagist. The subject matter upon which all poets work is the same, and it is not different from our subject matter. We are living in the same world and dealing with the same materials. The difference between one poet and the other is the same difference that exists between all poets and ourselves. The difference is that one poet looks at subject matter as representation of a unified universe and others (Yeats) as being separated. In Yeats the existence is a dual existence. In his book "The Tower," which included such famous lyrics as "Sailing to Byzantium," "Leda and the Swan," the most representative emblem of fire is hell. Line 3: "Tree, like a sooty finger, starts from earth:" According to Yeats, art is a not a deliberate creation but it is a creation. It is not spontaneous, it is an art and not feelings. Art is not equal to feelings, it is creation. A poet can not say that he is going to write a poem, but he has to evoke feelings and this has to be created and worked for. It is not the automatic outcome of feelings though it is not deliberate. When he says not deliberate, he does not mean spontaneous. It is not the feeling but the creative model from which these feelings are made. So, poetry is a creation but not deliberate nor spontaneous as William Wordsworth believes (spontaneous overflow of powerful feelings). It is the creation of intense feelings, the target of poetry has to be emotional. Yeats says in a letter to a friend: "I have no speech, I have symbols". Speech is common but creative ability is not, it is characteristic of artists. A poet should have the ability to create intense feelings in his poem, so the emphasis or criterion is the model and not the feeling. Hence, when Yeats says "Sooty fingers," the implication is black. However, "Starts, call, and sends," are forceful verbs which are being used in a row. Sooty implies that the finger is coming from hell. "Sooty finger, starts from the earth:" he is creating a complete movement. Dual conception of the universe (hell & earth) and (day & declining beam). When he mentioned tree twice, he dropped the definite or indefinite articles (he didn't say a tree or the tree) as if the tree has become a noun, he adds a personal quality to the tree, he is giving it life. Line 4: "And send imagination forth:" This line is an elaboration of the previous one. He is saying that there is no subject which is poetical. Poets bring over subjects which they think are poetical and use them whenever they write poetry. William Wordsworth has touched on the issue when he spoke of poetic language. Poets borrowed the terms which were functional, but the time has changed; what was functional is no more functional nowadays. So, Yeats couldn't believe in inherently poetical things or else poetry would cease to be a creation. There is no inherently poetical things, a poet has to modify and create. The lines of this poem have sound unity but the rhythm and sense overruns this unity. The most distinctive feature of the poem in so far as the superficial surface structure of the poem is that we have couplet form. The couplet form here is modified because here we have a sound unity but not a sense unity. The form is inherited but modified. Here the regular Iambic pattern is not found. The form is the way a poet feels and thinks. Yeats is using the couplet form, but he thinks and feels in a different way than Dryden and Pope because the target of poetry changed from what it was before.